Safari Ranger DLX Arcade Machine is a safari themed four player game in which players must attempt to rescue the animals and relocating them to safety! This safari themed 4-player video redemption arcade machine boasts a 42” LCD monitor with HD graphics and unique, detailed scenes to give plahyers plenty to look at! The cabinet also features multiple levels of tension on the wheel mechanism with which you reel the animals in after securing them with your lasso – it feels so realistic! This game requires the use of skill and timing in order to secure the animals, and players will get points for each animal they successfully secure and relocate - the bigger the animal, the higher the score! On Safari Ranger DLX players simply press the button to launch the lasso at the animals running across the screen, then use the rotatable wheel mechanism to bring them in! Players will receive a Safari Bonus for rescuing the endangered White Lion! 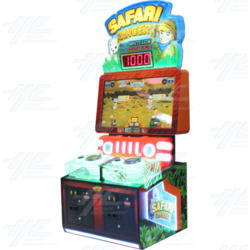 This safari themed 4-player video redemption arcade machine boasts a 42” LCD monitor with HD graphics and unique, detailed scenes to give plahyers plenty to look at! The cabinet also features multiple levels of tension on the wheel mechanism with which you reel the animals in after securing them with your lasso – it feels so realistic! This game requires the use of skill and timing in order to secure the animals, and players will get points for each animal they successfully secure and relocate - the bigger the animal, the higher the score! On Safari Ranger DLX players simply press the button to launch the lasso at the animals running across the screen, then use the rotatable wheel mechanism to bring them in! Players will receive a Safari Bonus for rescuing the endangered White Lion!